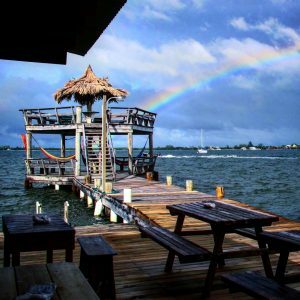 Sadly we can’t dive all the time, happily we have plenty to keep you entertained while you’re waiting for the next dive boat. Take a tour of our dive center and see if there is anything you like. Having a dry day? There’s no better place to relax than on the end of our dock. Pull up a hammock, grab a beer, a good book and enjoy the cool sea breeze. In the evening you can watch the sun setting over the bay and the stars coming out. Our beach is for customers only and is another great place to relax or play games. Right in front of our hostel rooms you can fall out of bed and onto the beach. Just the thing for the morning after. 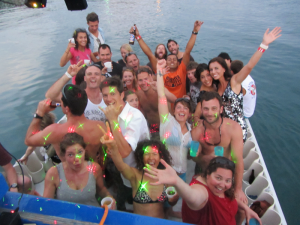 The Tipsy Turtle (our on site bar) opens at 7am everyday to serve coffee and breakfast before our morning boat leaves. We have 8 different breakfast options, ranging from around $1.50 to $4.50. The ladies at the Tipsy also do a tasty lunch special every day, usually around the $5 mark. From 2pm it offers drinks and snacks all the way through to 7pm (sometimes later!). The pride of our dive center. 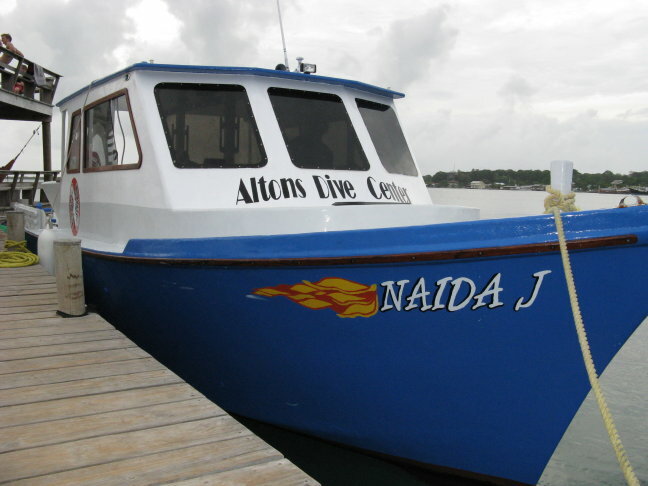 Get from the center to the dive site in comfort and style. Our boats meet all international coastguard standards with modern safety, communication and navigation equipment. They are regularly serviced throughout the year and every 12 months they go into the dry dock for a 3 week long rebuild of the whole boat. From a full engine service to a new paint job. The Naida J had a rough start in the dive industry, originally a tug, she was rebuilt from the hull up to accommodate diving. With a new 370hp engine and a name change nothing seemed to go right. Our engineers told us changing the name was bad luck so with a service, naming ceremony and launch she was back in the water and has been a solid boat ever since. Safety first, our equipment is new, well maintained and regularly tested. If you’re fun diving or training, good, comfortable equipment is essential to your enjoyment. We have BCDs in all size ranges and with the option of a weight belt or integrated weights. We have a wide range of long and short, male and female sized wetsuits for your comfort. We stock a wide range of masks in different styles and sizes. Your mask is important because it’s how you interact with environment. a badly fitting mask can ruin a dive so if yours is uncomfortable let us know and we’ll find a better fit. We also have a large variety of prescription masks available. Our full time technician, Gideon, keeps all of our kit in tip-top shape, from the compressors to the regulators. Time to study? Might as well do it in comfort. Our large classroom has air conditioning, a large flat screen TV and plenty of space to study. Your team’s playing or you want to watch a movie? Ask in the office and as long as the classroom is free you can take in a beer, some snacks and relax in front of the big screen. For all the magic to start underwater we need the office staff working hard to keep things running smoothly. The hub of our operation organizes the boats for each day, special trips and courses. Any time of the day you’ll find someone in here to help you out with any enquirers.